Auditors from Johnson, Madison, Jasper and Cerro Gordo Counties talk with lawmakers. A photo ID is “the least effective way” to confirm a voter’s true identity according to a county auditor who met with legislators this afternoon. Jasper County Auditor Dennis Parrott says the embedded “bar code” on a driver’s license is the best option. “The DOT tells us that not even the Chinese so far have been able to manipulate that bar code, meaning neither can any citizen in Iowa or New York or Alaska or anyplace else,” Parrott says. That bar code can be scanned and Parrott says information will pop up on a computer screen so poll workers can quiz the would-be voter about details that would confirm the voter’s identity. Parrott points out that some licenses may have a 10-year-old photo if the voter renewed their driver’s license online. About 150,000 Iowa voters do not have a driver’s license. Iowa Secretary of State Paul Pate is asking legislators to adopt new voter verification methods and Pate’s suggesting he’ll issue voter ID cards to that group of Iowans. Parrott says those cards should include that secure bar code for scanning and confirming a person’s identity. Parrott says a person’s signature on their voter registration could be a “useful” means of verification, but it will create “a terrible burden” for the state’s 9000 poll workers. 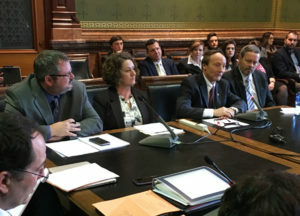 Parrott and three other county auditors testified before the Iowa House State Government Committee on this afternoon.